Create your own herd of tiny stuffed kittens with my digital stuffed cat sewing pattern! Each finished toy cat stands approximately 3 inches tall and 3 inches long. Included in this printable PDF sewing pattern are the pattern, diagrams, and instructions to create your own lil’ felt kitties with pose-able limbs and tails. 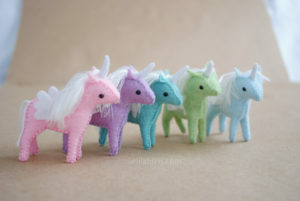 These little felt kitties are very easy to sew! They are meant to be created from felt or a similar fabric. This is a hand stitching project. Basic hand stitching skills are recommended but not required. There are hand stitching diagrams available here on my site. This is a fantastic project for beginners! This digital stuffed cat sewing pattern will come to you via email, with download link included. The pattern is in the form of a PDF file! This means that you can store this pattern in your computer or flash drive to print and create whenever you want. Sew piles and piles of adorable felt kittens! These toy felt cats make fantastic gifts, or rainy day sewing projects. Each cat works up quickly, in a matter of an hour or two! Make adorable felt kitten toys, or add a string and use them as an ornament!